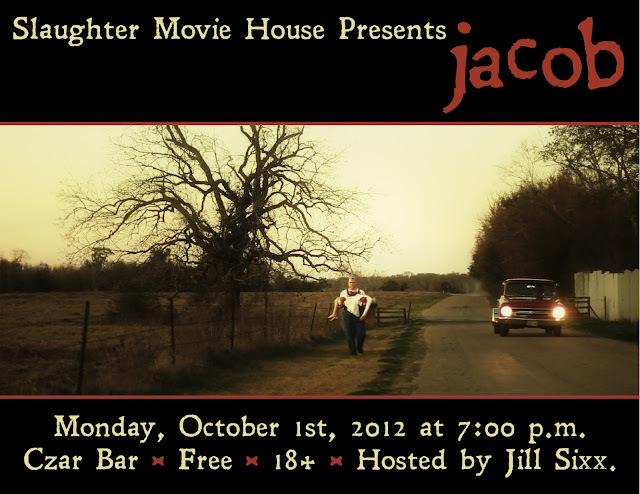 In order to kick off October properly, Monday, October 1st, we are screening Jacob and Burn at Czar Bar in KCMO. You may be thinking, “What? Two movies this time?!? !” I have recently decided to screen a short film at each SMH, along with the feature length. There will be a couple prize packs raffled off that include: a Burn DVD, Jacob poster signed by Larry Wade Carrell (Director/Writer/Actor), and a Dear God No! button designed by Lou Rusconi. Plus, I have TONS of tickets to give away to Hammerween III. Jacob is a good 'ol Texas film. I mean that in every sense: Larry Wade Carrell was born and raised in Alvin, TX, the film is set in Texas, and shot in Richmond and Rosenberg, Texas. And if you know me at all, you know I dig this a lot. Jacob is disturbed boy, in a really f**ked up back woods family, who doesn't cope very well, and goes straight for brutal revenge. A few weeks ago I went to HorrorHound Weekend in Indianapolis, which had a phenomenal film festival within it. I saw so many amazing shorts there, that I knew I had to bring them back to Kansas City! Not only that, I met so many great people there, I've been inspired by their creativity. And that brings me to Burn, a short by Jerry Pyle, from Indiana but now resides in L.A. I knew I had to get this film quickly because it would fit well along side Jacob. Burn is only 5 minutes long and I feel there is little I can say without spoiling it. What Burn leaves your imagination to figure out is part of the magic in it. Not to mention it is the most intense 5 minutes I've ever witnessed. A huge thank you to Berry Anderson and the Pitch Weekly, who gave this screening a great write up. Read it here.